A calendared blister card that effectively educates the patient with Bipolar Disorder Depression on how to titrate to their appropriate dose of SEROQUEL XR. The blister card is labeled by day and dose on each individual pill cavity, starting with one pill of 50 mg on Day 1, two pills of 50 mg on Day 2, one pill of 200 mg on Day 3, and one pill of 300 mg on Days 4-14. Visual cues prompt medication taking and facilitate tracking. 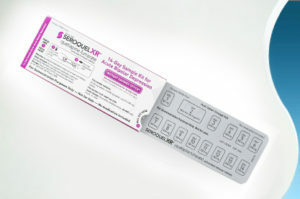 Extended label with easy-to-read information about the medication, the disease and dosing instructions, as well as easy access to an instant savings card for SEROQUEL XR. Impactful branding for AstraZeneca / SEROQUEL XR on the outer package’s readable, flat space. The SEROQUEL XR package builds on MWV’s legacy of designing medication packaging that’s proven to enhance adherence. MWV takes an evidence-based approach to inform packaging design. A first-of-its-kind peer-reviewed study published in Clinical Therapeutics found that even when used alone, without additional adherence interventions, MWV’s adherence packaging demonstrated a statistically significant impact over vials, improving adherence and persistence for long-term daily medications. It’s been shown to achieve an 80% PDC with up to 37% more patients versus standard vials , and a 41% increase in length of therapy when combined with other adherence programs . Eli Lilly Strattera is approved for the treatment of attention-deficit/hyperactivity disorder (ADHD) in children aged 6 and older, teens, and adults. Packaged by PCI for Eli Lilly, the Strattera Physician Sample Pack utilizes the MWV DosepakTM design in titrating patients through their drug regimen,progressing them to the target dose. 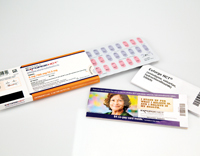 The package graphics feature distinctive varied color coding for the calendarized dosing format, identifying the starting dose of 18mg and continuing for the first five days of therapy, progressing to 25mg for the following five days, 40mg for the next five, and reaching 60mg, identified on the pack as the “Target Dose”, for the remaining 30 days of the 45 day therapy contained in the pack. Other versions of the titration dosing utilize a 10 / 18 / 25 / 40mg format, 25 / 40 / 60 / 80mg depending on the weight of the patient. Each strength combination is distinguished by a unique color configuration and identifies the recommended weight guidelines for the therapy. In further supporting patient compliance, the Strattera design includes a multi-panel label that identifies dosing instructions including tips to avoid side effects and identifying optimal daily timing for doses, along with its boxed warning and safety information. Patients are instructed to work with their physician to set goals for treatment, and prompted in the package’s calendarized dosing schedule to “begin evaluating symptoms” at Day 30. The multi-panel label also includes patient education facts regarding ADHD as well as information directing patients to a supporting website to seek further information, download and establish the goal setting progress tracker tool resource, download a discussion guide resource for patient-doctor interaction, as well as information for prescription savings for the patient. 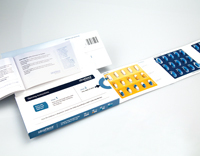 A patient information leaflet is also included for the patient in the cover panel of the Strattera Sample Pack. Novartis Exforge HCT (amlodipine, valsartan, hydrocholorothiazide) is indicated for the treatment of high blood pressure. Packaged by PCI for Novartis, the Exforge HCT blister package utilizes the MWV Shellpak Renew child resistant design to support patients in taking their daily medication. The package graphics highlight the calendarized format, helping support patients to follow their regimen as prescribed by their doctor. On the primary blister unit colorful graphics help to identify the starting dose, each daily dose, and reminds patients when the time to refill the prescription is approaching. The exterior packaging graphics highlight the opening instructions for the innovative push/pull child resistant feature, along with patient instructions for identifying their starting dose. Included with the Exforge HCT package are additional adherence tools such as a patient savings card to support patients with script fills as well as suggestions for the patient to visit the website and join the Get On Track program. The website contains disease state information, co-pay assistance and healthcare tips for patients with high blood pressure including recipes and health insights. Also included with the Exforge HCT package is the prescribing information leaflet. “The blister does a good job of delineating separate weeks through color and does a good job of including 4 weeks of therapy in one blister package extending compliance packaging to maintenance therapy which should have an impact on adherence,” one of the industry judges stated. The Compliance Package of the Year winner and the First Runner-up will be asked to designate HCPC donated scholarship funds to a university-level packaging school focused on the pharmaceutical industry.